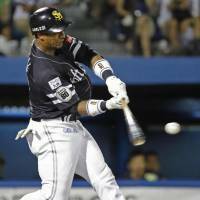 SHIZUOKA - Cuban Yurisbel Gracial scored twice and drove in three runs to pace the Fukuoka SoftBank Hawks to a 10-5 Pacific League win over the Hokkaido Nippon Ham Fighters on Tuesday. The 32-year-old Gracial, playing in place of injured countryman Alfredo Despaigne, helped pull the Hawks to within 1-1/2 games of the second-place Fighters by driving in the game’s first run and belting a two-run, fifth-inning homer that gave SoftBank a three-run lead. The home run was his first in Japan. “I am batting well right now, I was able to handle what the pitcher threw me and I’m glad I could hit a home run,” Gracial said after the game at Kusanagi Stadium, which hosted a famous 1934 game involving American Hall of Famers Babe Ruth and Lou Gehrig. Kenta Imamiya doubled with one out in the first against Kohei Arihara. Gracial singled him home, went to third on a Yuki Yanagita double, and then both runners came home on Nobuhiro Matsuda’s one-out single. The Fighters got two runs back in the bottom of the inning against Nao Higashihama with the help of two errors, but the right-hander limited the damage with a double play and an inning-ending strikeout. Higashihama (3-5) allowed three runs, one earned, over 6-1/3 innings on four hits, struck out seven and walked none. Arihara (7-4) surrendered 10 runs, eight earned on 16 hits over 6-2/3 innings. With the Hawks leading 3-2 in the fifth, Imamiya singled with one out and scored on Gracial’s home run. After Yanagita and Matsuda singled, Akira Nakamura hit his 11th home run of the season. Kotaro Kiyomiya hit a two-run home run for the Fighters in the seventh inning, and Sho Nakata hit a solo shot in the eighth. At Tokyo Dome, Seibu starter Shinsaburo Tawata (12-5) threw four scoreless innings before his poor control allowed Chiba Lotte to load the bases with two outs ahead of back-to-back RBI singles and a three-run Shogo Nakamura home run. At Sendai’s Rakuten Seimei Park Miyagi, Shintaro Masuda hit a three-run homer, while Zelous Wheeler homered and drove in two runs to help Tohoku Rakuten’s Takahiro Norimoto (6-9) win his first game since July 5 despite allowing five runs. At Yokohama Stadium, veteran lefty Tetsuya Utsumi (5-3) allowed one run over seven innings, while Kazuma Okamoto and Shinnosuke Abe each scored a run and drove in two as Yomiuri beat Yokohama. At Nagoya Dome, Onelki Garcia (12-6) scattered seven hits over seven scoreless innings and former Cuban compatriot Dayan Viciedo hit a three-run, first-inning home run as Chunichi defeated Hanshin. At Hiroshima’s Mazda Stadium, Tokyo Yakult scored the tying run in the ninth after a video review overturned what would have been the game’s final out. 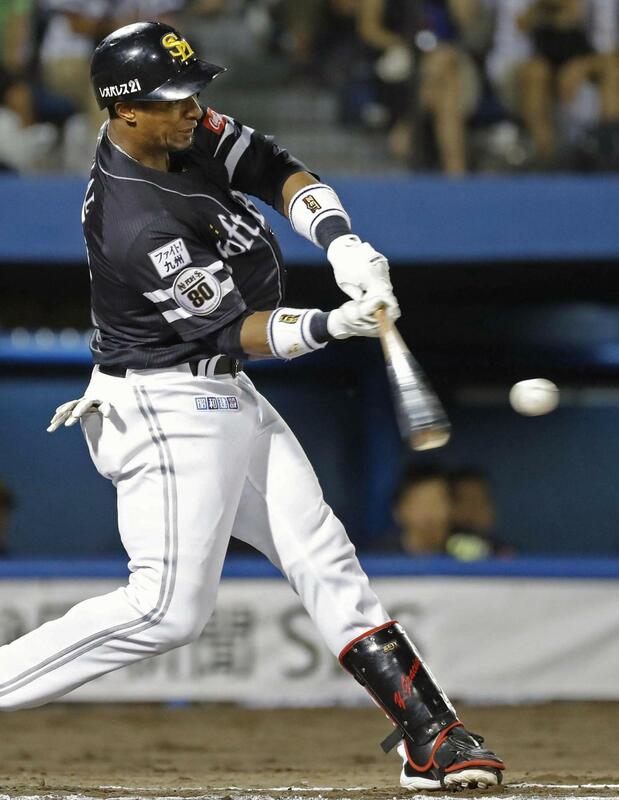 Wladimir Balentien then hit his CL-leading 31st home run to break the tie and trigger a five-run 10th inning against Hiroshima.